or the Indiana University evolution site, http://www.indiana.edu/~ensiweb/ home.html to be very helpful with explanations and examples. For an entertaining introduction...from Colbert Report. Then, watch Miller's second guest appearance, http://www.colbertnation.com/the-colbert-report-videos/173859/june-16-2008/kenneth-miller. More on the Trial in Dover, PA - see chapter 19-20 in Miller's HHMI lecture. Remember, step one in mechanism of Natural Selection - VARIATION! All the tropical tree snails in this image belong to a single species. The range of colors and banding patterns is only part of the variation that makes each of them unique. That variation is the raw material upon which natural selection acts, and, to the extent that it is heritable, is the basis for evolutionary change. Heritable variation is the key to evolution -- it supplies the raw material on which natural selection acts. Darwin's famous Galapagos Island finches displayed great variation in the size and shape of their beaks, which were adapted to different diets and ecological niches. Darwin understood that if this variation was inherited, natural selection could produce evolutionary change in a population by selecting "for" some variations and "against" others. But what was the source of variation in the first place, and how was it inherited? In what "secret writing" in the blood, as Darwin thought of it, lay the biological blueprints for a range of beak shapes, fur, feathers, sizes of limbs and organs -- a huge storehouse of biological possibility? It would be decades before genes and DNA were discovered, but they provided the answer Darwin sought. Each organism carries a set of genes that are passed along to the next generation. In sexually reproducing life forms, half of the genes of each parent are combined, and the offspring each inherit a different, random assortment of genes (except in the case of identical twins). Moreover, an individual's set of genes can be altered by mistakes, or mutations, in copying the DNA code. These mutations are not only an additional source of variation, they are the ultimate source of all genetic variation. Variation in a population means that some individuals have a better chance than others of surviving and reproducing. If the environment changes, a diverse population has a better chance of some individuals making it to reproductive age and carrying on the species. Degrees of heritable variation can be great or small, and given large enough populations and enough time, even minute variations can have powerful effects. For example, Peter Grant, who with his wife Rosemary has done the definitive study of Darwin's finches, says that half a millimeter's difference in the size of the beak of a finch can mean the difference between life or death under certain conditions. In this game, see if you can match modern dog breeds with the country or region where their forebears arose. As you'll see, while many of the dogs we know and love have an impressively long lineage, others are younger, owing their existence to the tinkering of breeders over just the last century or two. Scientists say they have seen one of the fastest evolutionary changes ever observed in a species of butterfly. See original article for a more modern example similar to industrial melanism. In this activity, learn why evolution is at the heart of a world health threat. Investigate the increasing problem of antibiotic resistance in such menacing diseases as tuberculosis and influenza. Take on the role of staff at a public health agency who are trying to communicate the widespread problem of evolving disease-causing agents to the public. Finally, Friends Evolution Montage - a chance to laugh at science! The evolution of whales has followed an intriguing path of marine mammal to land mammal back to the oceans again. Evidence for this progression has been growing and the story itself has evolved over the past 150 years. More recent developments have caused central scientists to rethink their own thinking, integrating macroscopic fossil evidence, in the form of transitional fossils, with analysis of molecular level DNA sequence homology between modern whales, pigs, deer, even (resulting in the closest match) hippos. A summary of this progression has been published by Brian Switek. Epigenetics is the change in gene expression caused by external environmental features, i.e., not just as a direct consequence of the sequence the DNA itself. (This is beyond a environmentally triggered gene expression, as we see in familiar environmental responses such as melanin production in response to sunlight). One route that this may take is via prions, which are infectious proteins that change shape and pattern of interaction based on environmental cues. Most people first heard about prions as the cause of BSE or "mad cow disease," but there are many other diseases, as well as a number of different hypotheses as to the mechanism of their interaction with the host organism. The evolution of whales may be yet another story that is, in part, connected to epigentics. Andrew Howley makes this case in Epigenetics, How Evolution is Evolving. Class assignment: after reading and discussing the concepts and links above, reconsider the Darwin v. Lamark debate. Have your ideas/interpretations grown or changed in any way? So Natural Selection takes a LONG time, right? Well...maybe not always. The impact of epigenetics is influencing even the fundamentals of Darwinian evolutionary theory. like in this picture. Genes for switches, turning on spots formation in wings can change the overall pattern on fly wings in single mutations. Watch the video below all the way through to see how this works for even more drastic changes, like the location of organs on/in the body! Just how does development influence categories of organisms (and hence what we see as differently evolutionary product). We have heard already about "junk" DNA not being really junk, but regulatory genes that turn on other genes. This is one way that body plan can change in big steps. Also involved are the epigenetic influence of proteins in the the egg, before the new fused nucleus of the zygote is expressed. In class practice with Hardy-Weinberg Equilibrium problems. (and solutions.) Finished these, need to practice for quest? Try more. A very comprehensive introduction to Evolution, From the Beginning...link to prezi. Recall the BBC The Cell from Year 1? Here is a later episode on "The Spark of Life." We rejoin Adam Rutherford (and the symphonic soundtrack...) as he narrates three major story threads regarding Origin of Life, where do amino acids come from, where do nucleic acids come from, where do lipid membranes come from? 1. To begin with, what evidence suggests that the whole of all livings things can be traced back to the one first cell (think about what is inside the cell as well)? 2. What is the history of science connection between evolution and origin of life (Darwin)? 4. What NEW information has emerged from retesting Miller's apparatus? 5. What major idea did Crick propose after the structure of DNA? 6. Review the process of bacterial transformation as we did with GFP and compare to Boyer's first work with _______. How does this connect to what you responded for question #1? 7. List real evidence that life came from outer space!! 8. Outline the questions and answers being pursued by Szostak - list chemicals, processes involved. 9. What about synthetic cells??? what does that actually mean and what is required to accomplish it? And...how is this different form cell transformation (GFP, insulin, etc.)? PROTOCELL CIRCUS by Dr Rachel Armstrong and Michael Simon Toon. Protocells could be the beginning of life on Earth, perhaps the birth of consciousness itself. These simple ‘prototype cells’ are tiny bubbles, the result of a reaction between a few basic chemicals. They exhibit complex and life-like behaviours which seem to validate Aristotle’s theory of Spontaneous Generation, which was made obsolete by Louis Pasteur’s Germ Therory but which never accounted for the origin of the germs, only their proliferation. The film also potentially answers Charles Darwin’s unanswered question regarding the “spark of life” that started evolution on its journey. If the behaviors of the protocells really are recognizable as similar to our own, it may be because our own behaviors actually reflect those of the protocells - the evolution of a basic chemical reaction. Find out more, by google searching the terms Abiogenesis, Primordial soup or Origin of life. Protocell Circus was produced in 2010 and exhibited in the same year at the Royal Society’s British Film Institute in South Bank, London, Chelsea Art Museum in Manhattan, New York, and Google Headquarters, New York. In 2011, it was referenced in a paper published by the German Ethics Council titled, “The importance of synthetic biology for science and society,” and in the same year was exhibited at ‘Synth-ethic,’ an Art and Synthetic Biology Exhibition at the Natural History Museum in Vienna, Austria. Protocell creation and video production by senior TED fellow and UCL teaching fellow Dr Rachel Armstrong at University College London lab. Editing, sound design, post-production and “thought moments” subtitles by Michael Simon Toon. Endosymbiosis - theory of the origin of eukaryotes, i.e, where do organelles some from? Click on the diagram to the left to load a case study explaining this theory. Pay special attention to the frames describing the evidence for endosymbiosis. From the photocopied supplement to the Biozone Workbook (blue book, white owl) look at and annotate the following diagrams/figures. Those marked with * are figures you should be very familiar with for the quiz. This segment is about the role of RNA or related molecules in the origin of life question. Listen below. Old News/New News - is the new really new or a change from the old news? Every year the HHMI (Howard Hughes Medical Institute) sponsors the "Holiday Lectures." Evolution has been the theme for three of the last seven years. The HHMI site archives these talks by internationally renowned scientists. Try the following for various 5.4 assessment statements. 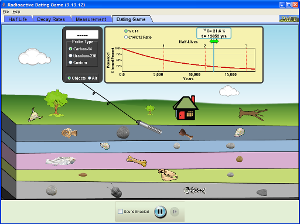 Try some sample radioactive decay calculations - play the game above! Approximately how old is a fossil with 12 g of 14C if it initially possessed 32 g of 14C? Approximately how many grams of 14C did an organism initially possess if there are 7 g remaining after 17,830 years? If 12% of the initial amount of 14C in a sample remains, how much time has elapsed? E. Not enough information is provided to answer the question. Suppose an organism has 20 g of 14C at its time of death. Approximately how much 14C remains after 10,320 years? Good overview, with attention to the impact of context for scientific research (Darwin), the importance of considering time scale (North American fossils vs African, Asian, European), the impact of human evolution on modern medical issues (childbirth issues, dietary conditions) and how human display effects of natural selection. As you review this talk, look for the themes of trends in brain size, facial/mouth structure, bipedalism, diet, geography, and culture/social relationships. Examples from 6mya to 100,000ya. Ardipithicus to Homo...we looked at chapters 9-13 in class Friday Oct 18. Then visit the Biozone workbook pages 27-28, 29-30 for exercises and good summary diagrams on this material. Highlight for the above listed trends in hominid evolution. Are humans still evolving? Molecular evidence that we are. First a bit of background, then to Tishkoff's presentation. one on the evolution of the lactase gene, as we have discussed numerous times in class. and another on the biochemistry behind lactase activity. Very nice background on paleobiology discoveries, but one of the most powerful aspects of this site is the well-archived and recently updated news thread on the subject. Click on logo to see. For background on the cave called Denisova and the significance of what was discovered there, see the news article Look Ma, No Bones appearing on this website two years ago and discussing the extent to which genetic analysis is overtaking fossil evidence. how are you on these sample questions? 1. How extensive is the gap in the fossil record? What is it due to? 3. Benefits of bipedalism - many...list? Any negatives? 4. Consider innate vs. learned traits...where does tool making fit it in? What about other species? 7. Positive/negative of reduced snout/sense of smell? 8. Parallel groupings analogous to primates...preview of classification. 9. Impediments to interbreeding among early hominids? 11. What selective pressures may have separated humans from rest of primates?? 12. What's so special about Lucy? fossil? traits? 14. What does evidence of language look like? 15. Is the rate of random mutation stable enough to use as a molecular clock? How is random mutation different than genetic drift? For notes. Q/A on evolution videos.